Be smart about the start. 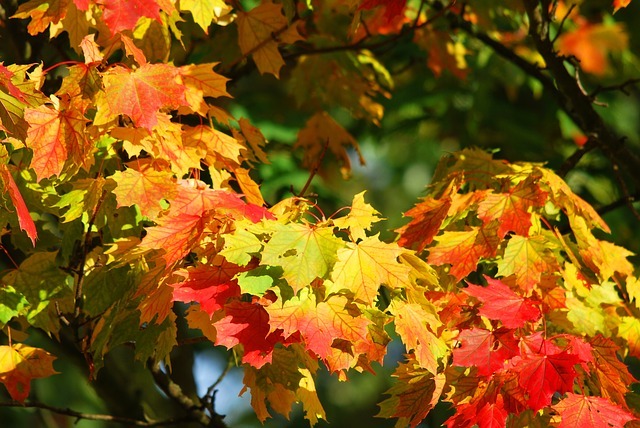 It may be tempting to get outside with the first break in the rain, but wet leaves are heavier than dry ones. If you can, and the forecast cooperates, wait a day or two to let the leaves dry out. Warm up and stretch. Before you pick up the rake, think about the best stretching practices we discussed last month. Remember to hold each stretch for at least 20 seconds. It will be your instinct to want to bend at the waist and reach your hands toward your toes. DO NOT DO THIS!! Instead, stand tall, reach both hands and arms to the sky. Take several deep breaths. Place your hands on your hips and push down and forward as you tip backwards a few times. Step forward with one leg and lift the front of your foot to stretch the muscles of the back of your leg. Repeat on the other side. Do not tip your neck from side to side, rather, look up slowly, (do not force the motion into pain), then slowly look over each shoulder, (again stop at pain). Watch your posture. 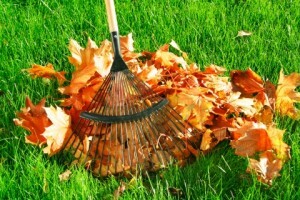 While raking, keep your weight balanced and maintain a slight bend in your knees. Try not to bend forward. Avoid twisting too much and overstretching. Think about how you can REVERSE repetitive postures and actions. For example, switch your hands around every few minutes to help not to put too much stress on any one side of your lower back. When scooping up the leaves, use your knees to do the heavy lifting, not your back. Use the right tools. Make sure your rake is the right size for your body, not too tall or too short. Use a garden cart to assist in transporting heavy bags. se the right tools. Make sure your rake is the right size for your body, not too tall or too short. Use a garden cart to assist in transporting heavy bags. Take your time and take breaks. Hurrying too fast, or trying to get it all done in one outing, can cause you to not pay as close attention to how you are moving. Try to take a break every 15 to 20 minutes and stretch to give your body time to rest. And, drink water to hydrate your muscles. Listen to your body. If your back is aching and your shoulders start to hurt, stop. Try stretching. If you are still sore, take a break for a few minutes or call it a day. Ice it up. After you are done for the day, ice your back and shoulders for 15 – 20 minutes, repeating every few hours. If soreness continues more than 2-3 days, contact our office. Nextdoor is an online social network for your neighborhood. Join and place a classified asking your neighbors for assistance. It helps everyone if yards are tidied up. Volunteer Chore Services is operated by Catholic Community Services and provides assistance for elderly and disabled people, including yard work and home repair. Your local high school. Many high schools in our area have volunteer requirements for graduation and will post volunteer opportunities at school or in their newspaper. Sports teams are always looking to raise funds if you have a significant amount of work and have the ability to make a donation. Contact your school’s office and see what opportunities exist. Neighboring places of worship. Contact a nearby church to see if they have a volunteer group that helps in the community. Know your body and respect your limits. 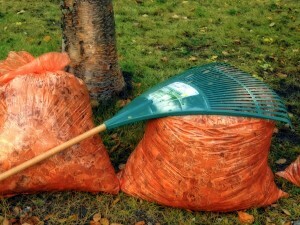 If you pick up that rake, pace yourself and pay attention to growing discomfort. But, if you need help, ask.